Old Car Memories > Commentary > FCA To Kill Hemi V8? The return of the Chrysler Hemi V8, 14 years ago, was a glorious event. The Hemi name is a legend. 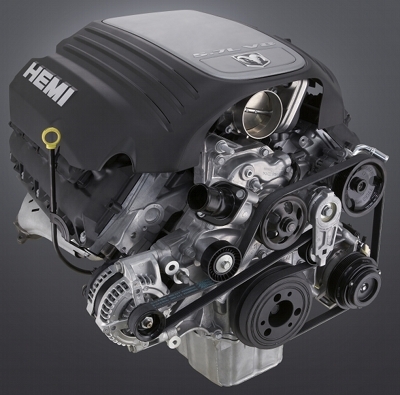 This all-new third generation Hemi debuted as a 2003 Dodge Ram pickup truck option. It had 5.7 liters of displacement. It was a state-of-the-art pushrod V8 that produced 345 horsepower and 398 lb-ft of torque. Soon thereafter Chrysler’s Multi-Displacement System (MDS) was added to most iterations of the Hemi to maximize fuel economy. The 5.7 liter Hemi was considerably more powerful than the 5.9 liter LA series V8 it replaced – 30% more powerful to be exact. To increase horsepower and efficiency Variable Valve Timing (VVT) was added to the 5.7 liter Hemi for 2009. Depending on the application the factory horsepower ratings were between 360 and 395 horsepower. The torque ratings were now between 390 and 410 lb-ft torque. The 5.7 liter Hemi has been the most popular Hemi ever produced. It has powered many pickup, SUV, and car models over the last two decades. Unfortunately its long production run will soon come to a end. Allpar just reported that 2018 will be the 5.7 liter Hemi’s last model year. Allpar’s sources have reported that the EPA’s ever rising CAFE standards are the main reason for the cancellation. These sources also report that if the CAFE standards should be relaxed before the planned cancellation, the 5.7 liter Hemi may continue production. The cancellation is no surprise since the rumored bump in the 5.7 liter’s horsepower as reported a few years back, never occurred. 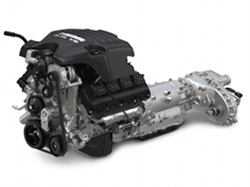 The fate of the 6.4 liter Hemi versions used in SRT and Ram Truck applications is not known at this time according to Allpar. Motor Authority last year reported the 6.4 Hemi V8s would be cancelled in 2019. Motor Authority’s report mentioned the 707 horsepower supercharged 6.2 liter Hemi currently used in Dodge’s Hellcat Challenger and Charger would also be cancelled at that time. However Allpar’s sources claim that the Hellcat’s Hemi V8 will be alive and well until the 2021 model year. It’s expected in the future that as the different Hemi V8s are discontinued, they will be replaced by twin-turbo versions of its Pentastar V6. This is the same strategy Ford has been implementing the last few model years, replacing the Boss and Coyote V8s in its vehicle lineup, with different twin-turbo Ecoboast V6s. Let’s hope FCA will find some way to continue to produce the Hemi and still comply with the ever-rising CAFE standards, right now that appears to be a very tall order. The stark reality is in few model years the Hemi V8 will more than likely be permanently absent from FCA’s new vehicle lineup. When that day occurs it will not only be a sad day, but the performance reputation of FCA’s American brands may seriously suffer. Best advice I can give, is if you want a new vehicle equipped with a Hemi V8, better buy one soon before they are gone forever.